How to Reset iPad without Apple ID Password? 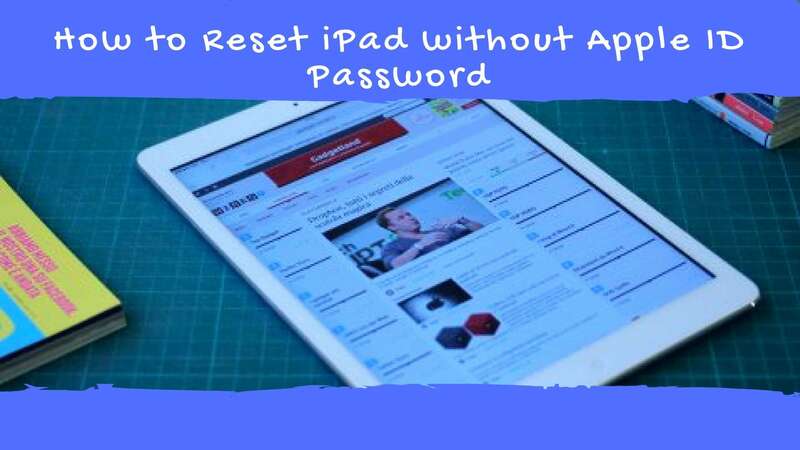 You may have to reset or erase or factory reset your iPad or iPhone without your Apple ID password many times due to many reasons; one being, you don’t have your Apple iD or you have forgotten your iPad or iPhone Apple iD Password. And, if you have forgot your Apple ID and want to reset iPad or iPhone without Apple ID or Password, then you should follow the below steps to know, how you can Reset iPad without Apple ID Password or Erase, Factory reset, or Reset iPhone without Apple ID Password. You must know that restoring your iPad or iPhone to it’s factory settings or resetting iPad or iPhone to factory default will restore your iPhone or iPad to a new device. This means that you will lose all of your iPad or iPhone data. Restoring your iPad or iPhone to factory default settings erases and deletes all the data like Photos, music, messages, settings, wallet, cards, notes and many more things. Erasing iPad or iPhone to factory default without Apple ID password helps unlocking your locked iOS device and also helps to transform your device into a new one. There are several ways this can be done and this article takes a look at some of them. Note: if your iPad or iPhone is disabled and you don’t know your Apple ID and Password and your iPhone or iPad is Locked, then you can also use this iPhone, iPad restoration method to unlock your disabled iPhone as new. Now follow the below instructions and steps to restore your iPad to factory settings. If you forgot the passcode for your iPhone, iPad, or iPod touch, or if your iPhone or iPad is disabled and your iOS device is locked. Then, you might have to restore your iPhone or iPad to factory default settings. Just follow the below steps and choose the right way to erase your iPad or iPhone in order to unlock your disabled iPhone or iPad without Apple ID Password. If you forgot your Apple ID passcode of your iPad or iPhone, or your iPad or iPhone device is showing the message that “your device is disabled“, then you should follow these below instructions to remove your passcode. Note: You must know that if by any chance you have entered the wrong passcode or password on your iPad or iPhone six times continuously, your device will be locked out and you will see a message that your device is disabled. If you didn’t backed up your iPad or iPhone before you forgot Apple ID Password or before your iPad or iPhone was disabled, then there isn’t a way to save your iPad or iPhone data. All of your iOS device data will be formatted and erased, and your iOS device will be restored to it’s factory default settings. 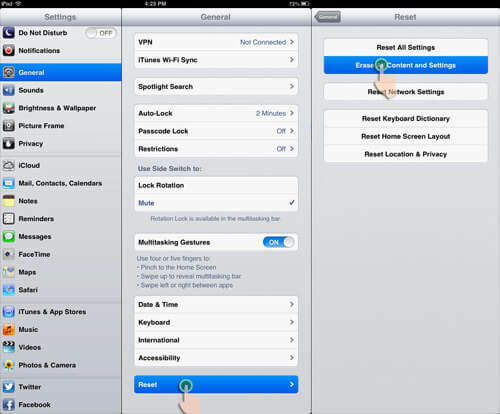 Now, there are two methods given below by using which you can remove your passcode from your iPad or iPhone. The second method will erase and delete all of your iOS data. Choose the first method to reset iPad without Apple ID Password, if you had previously synced or backed up your iOS device. If you’ve synced with iTunes, use iTunes. If you can’t sync or connect with iTunes, use recovery mode. if you had previously synced or backed up your iPad or iPhone device to iTunes, you can restore your device using this method. This will erase the device and its passcode. In the first step, just Connect your iPad or iPhone to the PC you synced with. Now you have to open iTunes, if it asks you to enter a passcode, then you can try another computer you have synced with or you should use recovery mode. Now wait for sometime until iTunes starts syncing your iPad and iPhone, and wait for it until your iOS device backup is complete. And, if, for any reason, it doesn’t backup your device, learn what to do. 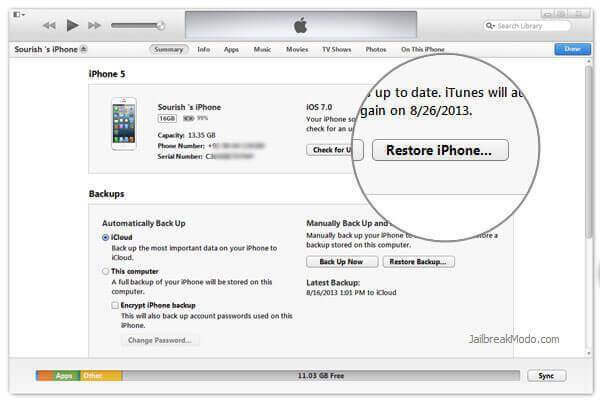 After the process of syncing and backing up your iPad or iPhone is done, just click Restore [your device]. Now you will see a Set Up screen on your iPad or iPhone While restoring it, just tap Restore from iTunes backup. Now in the next step just tap on your iOS device in iTunes and select it. Choose the latest backup from iTunes by checking the date and size of the backup. Your iPad or iPhone will be restored and all the backup data will also be restored and you can set new passcode for your iPhone or iPad. 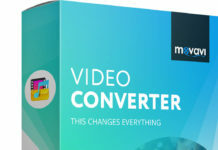 In the first step, just connect your iPad or iPhone to PC. Now open iTunes, if it doesn’t opens automatically. Now you have to force restart your iPad or iPhone while it is connected to your PC. On an iPhone 7 or iPhone 7 Plus:Press and hold down the power button located on the right side of the iPhone 7. While holding down the power button, press and hold down the Volume Down button on the left side of the iPhone 7. Hold down both buttons until the screen turns off. After a few seconds, the screen would come on, displaying the Apple Logo . Continue holding both buttons for about 10 seconds, until the  Apple logo appears. Now you will see a new window, you will see two options Restore or Update, just choose Restore. Now, iTunes will start downloading for your iPad or iPhone. If it takes more than 15 minutes, your device will exit recovery mode and you’ll need to repeat steps 2 and 3. You have to Wait for the process to finish. Then you can set up and use your device. Parvinder Singh 1 year, 7 months ago. If you already set up your device, you need to erase all of its content before you can use these steps to restore from your backup. 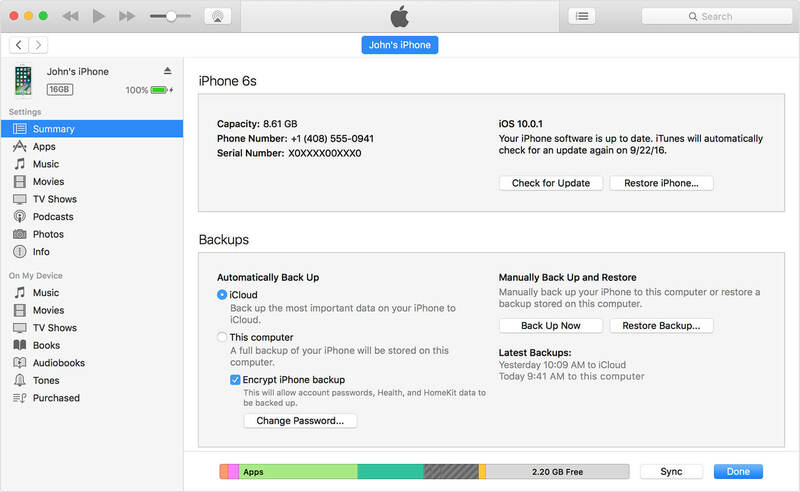 Follow the onscreen setup steps, then tap Restore from iCloud Backup. Choose a backup. (If you don’t see onscreen steps to help you update, learn what to do). Stay connected and wait for it. It might need a few minutes to an hour to complete. To reset your iPhone or iPad go to Settings > General > Reset and then select Erase All Content and Settings. After typing in your passcode if you’ve set one, you’ll get a warning box appear, with the option to Erase iPhone (or iPad) in red. Tap this. 1) Launch iTunes on the computer to complete the restore process on. 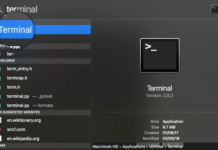 2) Connect your iOS device to the computer you are using for the restore. 3) Force-restart your iPhone by pressing and holding the Home button and power button until you see an Apple logo on the screen. When you see the logo, keep holding buttons; don’t let go. 4) After a little while longer, your iPhone should show a ‘Connect to iTunes’ screen like this one. At this time, you can let go of the buttons. Turn Off your iPhone 7 if it isn’t off already. Press and hold down the On/Off button for 3 seconds. Turn Off your iPhone, iPod touch, or iPad . Press and hold down the On/Off button for 3 seconds. Press and hold down the Home button on your iPhone, iPod touch, or iPad. At this point, iTunes should display an alert saying it’s detected an iPhone, iPod touch, or iPad in recovery mode, and will let you restore your device. It’s best to turn it off manually if you have an older-generation iPad. Find My iPad uses Activation lock, which basically prevents thieves from turning it off or erasing all your content. To switch it off go to Settings, then iCloud and tap Find My iPad to switch it off. (Settings | iCloud | Find My iPad). Make sure you’ve unpaired your Apple Watch from your iPad. Open the Apple Watch App on your iPad, tap My Watch Tab, tap your Watch at the top of the screen, tap Unpair Apple Watch and tap again to confirm. You may have to enter your Apple ID and password . a backup will be automatically created by iPad or iPhone of your watch before erasing the content. You’ll need to make sure you have a backup of your device. You can follow Apple’s guide to backing up your iPad here. Depending on the iOS you run on your iPad, you’ll either have to sign out or delete your iCloud account from your iPad. Unlike with iOS 10, there’s no need to sign out first. 1.Go back to Settings | General | Reset| Erase All Content and Settings. 2. If prompted, enter the device’s passcode. 3. Tap Erase – this will erase all the content on the iPad. Plug your old device into iTunes and sync it, make sure that it does a full backup before you unplug it again. Once the process is complete, you can begin setting up your new device. 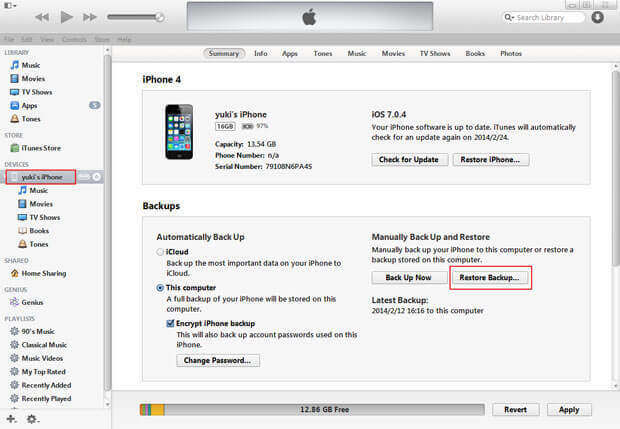 At the end of initial setup on the device itself, you’ll be given the option to Restore from iTunes Backup’. Simply tap this button, then connect your new iPad to your computer to restore it. 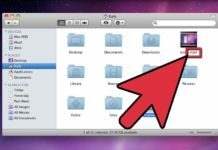 If you accidentally tapped ‘Set Up as New iPad’ instead, then all you need to do is connect your device to your computer, right-click on its name under the ‘Devices’ tab within iTunes, then click ‘Restore from Backup…’, . 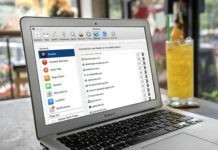 If you backup to iCloud, then the process is even easier. When you get to the end of the initial set up on your device itself, you’ll be presented with the option to ‘Restore from iCloud Backup’. Tap this button and select your backup, then allow your device to do its thing. You’ll then be asked to enter id or password; after the confirmation, your iPad Mini will reset and the Apple logo together with a loading bar will appear on screen. Upon the start up, all content, apps, music, photos, and personal account information will be erased from the iPad Mini. 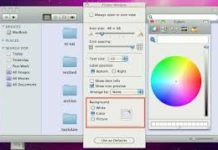 Connect your iPad Mini to your desktop computer. Start iTunes. Locate your iPad Mini under ‘Devices’ on the left panel and click on Restore. Find out how to restore the device using recovery mode. With the device power off, press and hold the Home button. 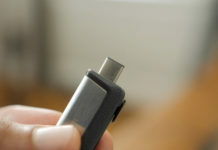 While holding the Home key, connect the USB cable to the device. Wait until the Apple logo appears and keep holding the Home button for few more seconds. Continue holding the Home button until the iTunes logo appears. If prompted with “The software on “iPad” needs to be restored to factory settings or updated”, click Restore. 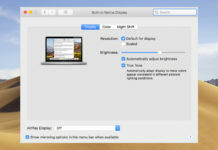 In iTunes, click Restore and Update, then follow the steps on screen. The device has been restored using recovery mode. Once you plug in your iPad and have iTunes open, click on the iPad icon in the upper left area of the iTunes window if the iPad Summary page doesn’t appear automatically. You’ll see timestamps below the Restore Backup option the last time that iTunes and iCloud Backups were completed. You may need to turn off Find My iPad before continuing. On your iPad navigate to Settings → Tap on your name at the top → iCloud → Find My iPad. Make sure to select the exact backup you’d like to restore from as you may have multiple backups and/or devices to choose from. When the restore process is complete, eject your iPad by clicking the eject icon in the top left area of iTunes. And that’s how to restore an iPad from an iTunes Backup. IEEnews › IEEnews Windows, iPhone, Android, Gadget, Mac, How to Forum › How to factory reset an iPhone using the smartphone: Erase and restore iPhone without a computer. If you can’t access a computer and your device still works, you can erase and restore your device without a computer. Select your iPhone, iPad, or iPod when it appears in iTunes. Then iTunes erases your device and installs the latest iOS or iPod software. After your device restores to factory settings, it restarts. Now you can set it up as new. General > Reset > Erase all Content and Settings. you’ll be presented with an iPhone/iPad as if it were straight out of the box. It is just as simple to restore your iPad Mini without iTunes. your iPhone or iPad Mini will reset and the Apple logo together with a loading bar will appear on screen. Yasin 3 years, 6 months ago. 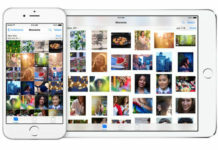 if you have not synced your device to your iTunes and iCloud accounts, or your computer is asking for your device’s passcode. Then only use this method. If you are full of bad luck and haven’t synced your iOS device to your iTunes and iCloud accounts, resetting your iOS device passcode or password using this method will erase or delete or wipe all of the data off of your iPhone, iPad and iPod touch. This feature is implemented by Apple in order to prevent an unauthorized user from accessing your data. How to Reset iPhone and iPad forgot password without using iTunes. mohammed shaikh 3 years, 6 months ago. USe iCloud to reset your device and unlock it. By using iOS Recovery mode . Using iTunes on your PC to Backup and Reset Your iOS device Password. How to Reset iPhone and iPad forgot password without using iCloud. 8. The first stage in the restore process unlocks the iPad, you are basically just canceling out the restore process as soon as it reactivates the iPad. 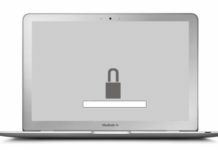 IEEnews › IEEnews Windows, iPhone, Android, Gadget, Mac, How to Forum › How do i reset an iPad to factory settings without knowing the passcode? Follow these steps if you’ve forgotten your passcode, or if a message says that your device is disabled. Thank you for the link on how to get into Recovery Mode. That was the missing part of the puzzle. It looks like it’s doing the restore. Wait for iTunes to sync your device and make a backup. If it doesn’t, learn what to do. If your device isn’t connected to a Wi-Fi or cellular network, you can’t erase it with Find My iPhone. While your device is connected, force restart it: Press and hold the Sleep/Wake and Home buttons at the same time. Don’t let go when you see the Apple logo — keep holding until you see the recovery mode screen. If you forget your iPad’s passcode, you won’t be able to access your files and you will need to reset the device by putting it in recovery mode. Recovery Mode is also useful if you want to erase the iPad’s settings or troubleshoot a problem with the device. If you’ve never synced with iTunes or set up Find My iPhone in iCloud, you’ll need to use recovery mode to restore your device. This will erase the device and its passcode. Go to your iPhone Settings then > iCloud. Scroll down and Tap on ‘Find my iPhone’. After that Go to > iCloud. Sign In with your Apple ID and password to access iCloud. Select and Click All Devices at the top of your browser window and select on iPhone device you want to reset your passcode. After selecting the device it will show you three options play sound, lost mode, Erase iPhone. Click erase device to erase or reset its password or passcode. 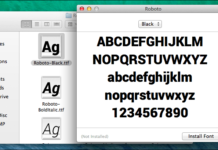 Now you can use your iOS device again. if you have forgot your Apple ID and want to reset iPad or iPhone without Apple ID or Password, then you should follow the below steps to know, how you can Reset iPad without Apple ID Password or Erase, Factory reset, or Reset iPhone without Apple ID Password.